Caño Tiburones is a natural reserve located in the town of Arecibo, even though its territory stretches into Barceloneta. This location is unique in Puerto Rico due to its ecology and hydrology. Until the mid-20th century, this zone was one of the largest wetlands in the island. Usually, subterranean water flows from the warmer southern water basin towards the coastal zones and the wetland fringe area. In the past, there had been a balance between fresh water and salt water that entered from the sea towards these wetlands, maintaining mostly freshwater zone. Thanks to this balance, El Caño has sustained its abundant aquatic fauna. This process and balance were altered in the decade of 1940 when water draining canals were built with the goal to dry up these areas to plant sugar cane. This change has had grave consequences for this area and affected the flora and fauna of the region. Some pumps carried over 105 mgd of water, including aquifer-bound water, off the wetlands. This caused the water canal levels to remain under sea level, which in turn made sea water return to the drain canals through springs. The salt water mixed with the fresh aquifer water and flooded several previously freshwater areas. In 1998, the natural reserve known as Caño Tiburones was created and, thanks to this, the zone was partly restored. The pumping system was fixed and fresh water has redistributed through the areas. Still, these waters are of poor quality due to its salinity. Today, septic tanks from residential and commercial areas are probably indirectly depositing contaminated water into the basin. Also, the Cambalache thermoelectric plant from the AEE deposits their water on the Arecibo Bay and extracts approximately 1 mgd of aquifer water hydrologically connected to the Caño. These events are likely causing damage to the basin and to the restoration efforts of Cano Tiburones, and civilians of the area report wariness about the ecologic wellbeing of the area. 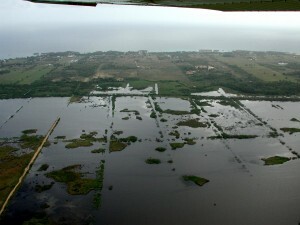 In 2015, SOPI (Sociedad Ornitológica Puertorriqueña Inc.) and other Arecibo civilian organizations have acted to demand that the DRNA and the Planning Department follow Public Policy and designate protected areas with vegetated wetlands in Caño Tiburones as a natural reserve considering there are areas that are not being protected as the once mentioned before. According to them, the terrains excluded from the initial designation have extensive wetlands of great ecological value that should be protected as part of the reserve. 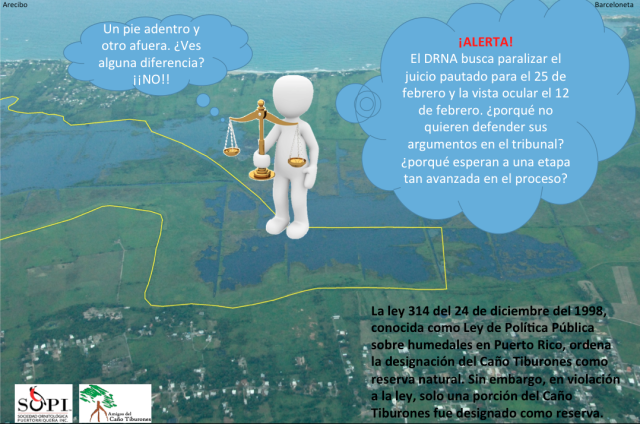 Development of Alternatives Currently the SOPI (Sociedad Ornitológica Puertorriqueña Inc.) is trying to expand the Nature Reserve to help prevent further contamination. Why? Explain briefly. The government is yet to come to a agreement with expanding the natural reserve and continues to allow contamination to enter the reserve.